Images by Tina MullerOne fine day I woke up and thought to myself : I want to have lavender hair. It was an unexplainable compulsion. I decided to label this desire as some weird capriciousness and get back to my normal life. A few years on and my hair colour adventure has officially gone mad. So much for ignoring my inner voice. After the colour pink, I moved on to the colour blue. 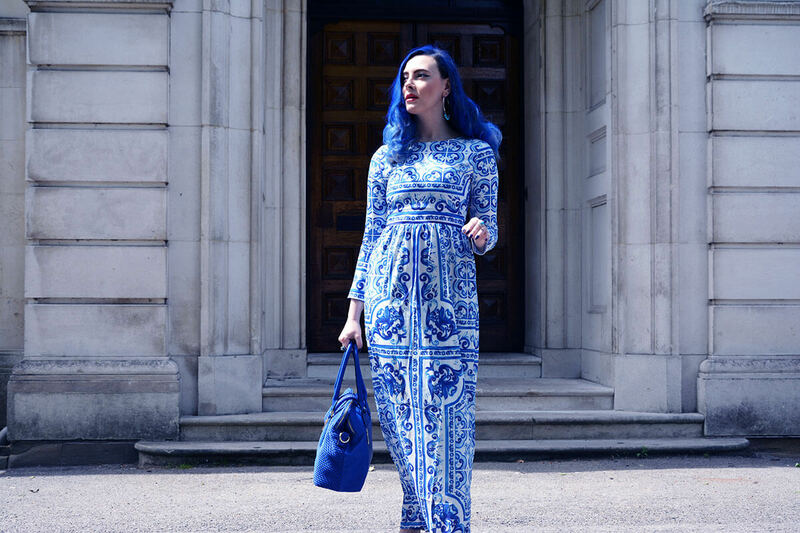 The print on this maxi from FashionMia reminded me of an ancient Greek vase – beautiful, dainty and delicate. It just begged for some matchy-matchy accents, so I thought I’d take the look a few steps further by painting myself completely blue, hair included. How to get temporary blue hair? Some of you have asked on Instagram and Snapchat whether I was wearing a wig. 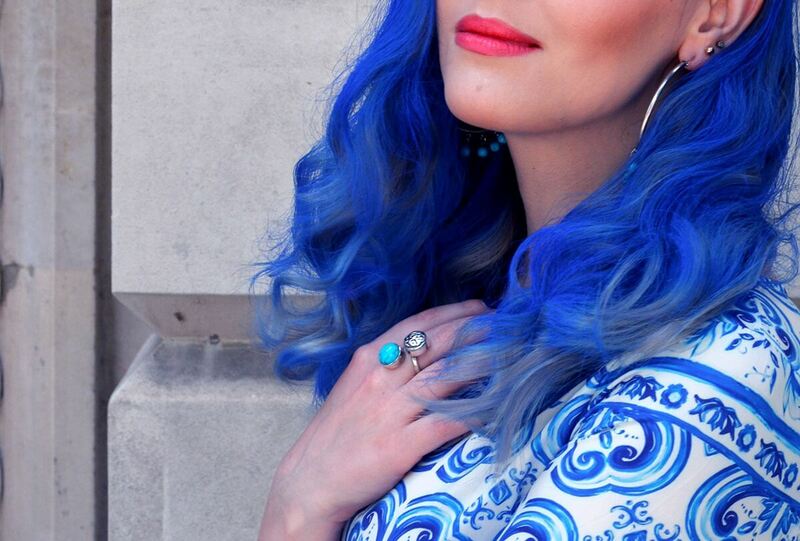 This is my actual hair and this was the exact shade of blue that I was keen on for this look. After all, Edie Sedgwick once famously chopped off her locks and sprayed her pixie cut silver, so I thought I’d try spraying my hair blue. It worked! 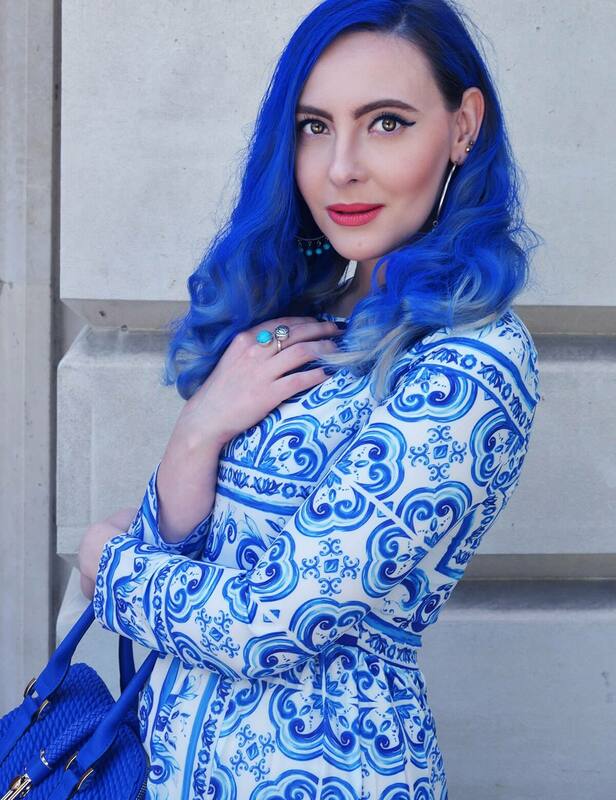 I purchased my blue hair spray from Superdrug here in the UK; if your local beauty store doesn’t have any coloured hair sprays, Amazon should be your next stop. 1. If your hair is light or bleached blonde, a darker blue shade may stain your locks and leave a yellow/brassy tint – but it’s nothing a white toner or silver shampoo can’t fix. 2. If you are worried about the product not washing off for the office the next day, you can exhale with ease. The product does wash off easily. Shampoo hair twice if needed. 3. After washing off the coloured hair spray I made sure I deeply conditioned my locks and put hair oil on the ends. It’s a great idea to keep doing that regardless, your hair will thank you for it. 4. Wear an old T-shirt while using coloured hair spray. I miraculously didn’t get any stains on my tee but it doesn’t mean that I won’t next time! 5. Spray your hair in an open space or make sure your doors are open because oh boy that smell is toxic. Thankfully it evaporates quite quickly, so while your hair will delicately smell like the product, it won’t be overpowering or become the topic of anyone’s conversation. After all, our goal is to make people talk about the colour, not the odour. 6. Be adventurous! Coloured hair spray allows you to have fun with wacky colours and forget you’ve done it the next day. Let me hear those pshhhhh sounds! What colour would you go for? In case you missed the previous coloured outfit, it was all about the colour pink. Omg! You look stunning! 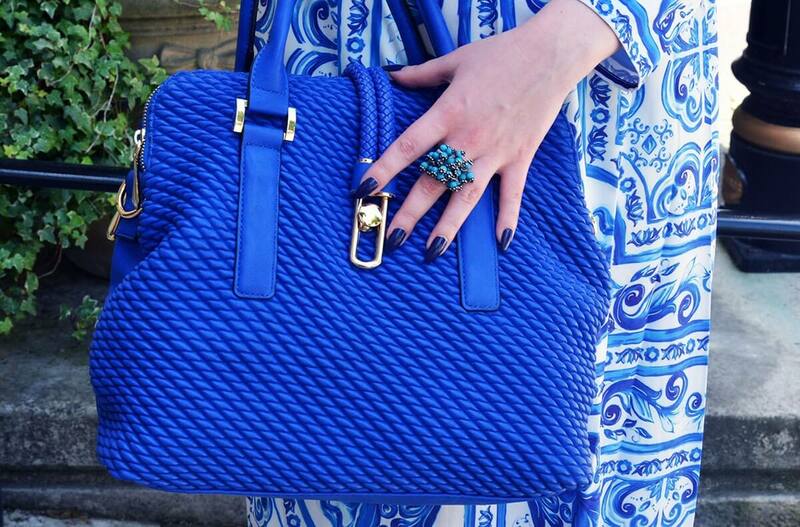 Perfect in blue! Beautiful look and photography!Thanks for the visit. Stunning photos, that’s my favourite shade of blue! And thanks for sharing about the hair spray. Last year I dyed my hair purple and I loved it but it damaged my hair so badly. I will have to do some research to see if there’s any hair spray in Canada and if it’s strong enough to colour dark hair! My porcelain Goddess! You are a vision! And did I just read that its a spray dye? I’m totally going to order online in that case! I’ve always loved the combination of white and this particular shade of blue, it reminds me of porcelain. So beautiful! Wow, incredible hair! You look fab babe and I love your dress!!! Matchy matchy haha wow most people match their shoes or makeup to their dress. You look fabulous! I can’t believe this temporary. I would have killed for this in high school. 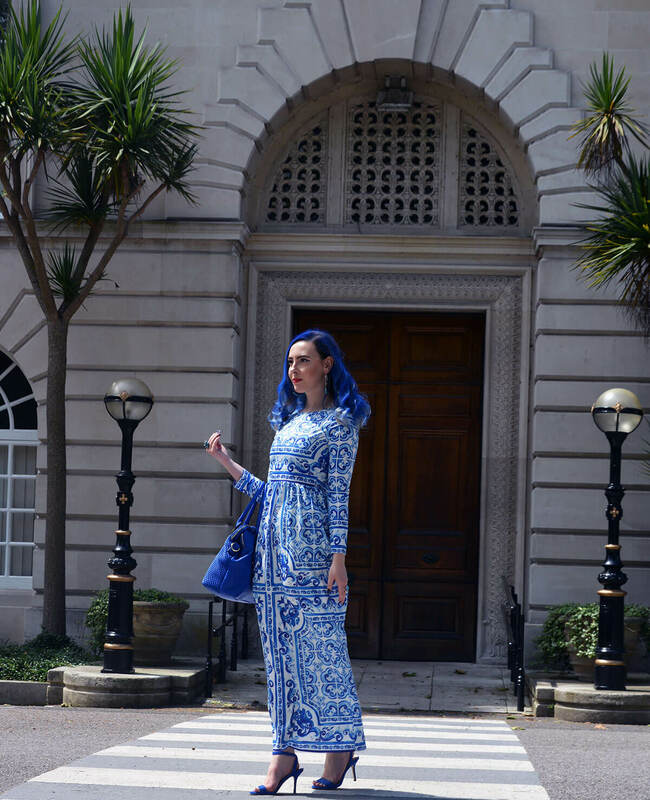 This long sdress looks absolutely amazing on you Edita! OMG, what an amazing transformation! Love it. I adore this look and photo! This outfit is insane! Love the look!!! 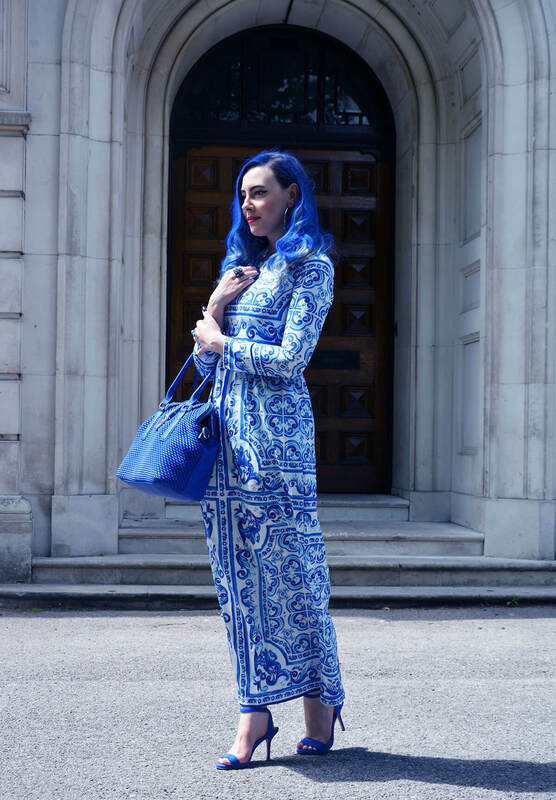 Wow, amazing look, lovely dress and incredible hair! This is all so creative. 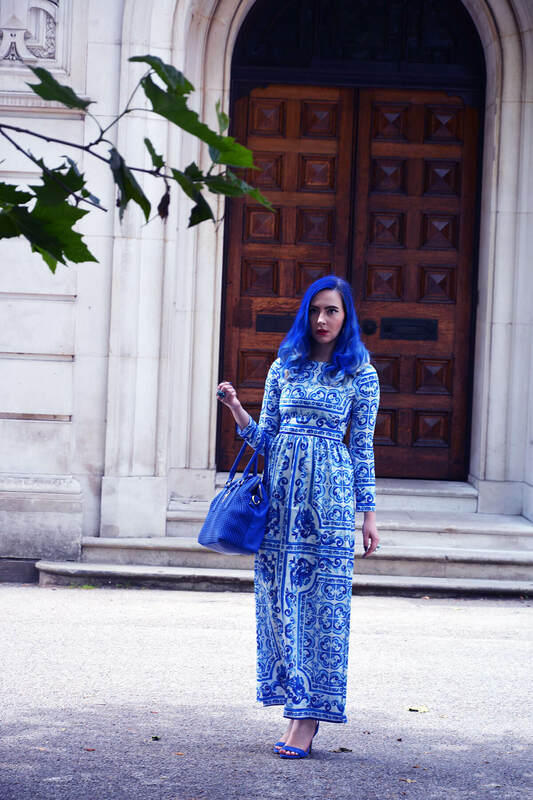 I love blue and love everything about your look even the shiny blue hair. Beautiful, keep the great work coming! Your hair is so cool. Goes well with that dress! 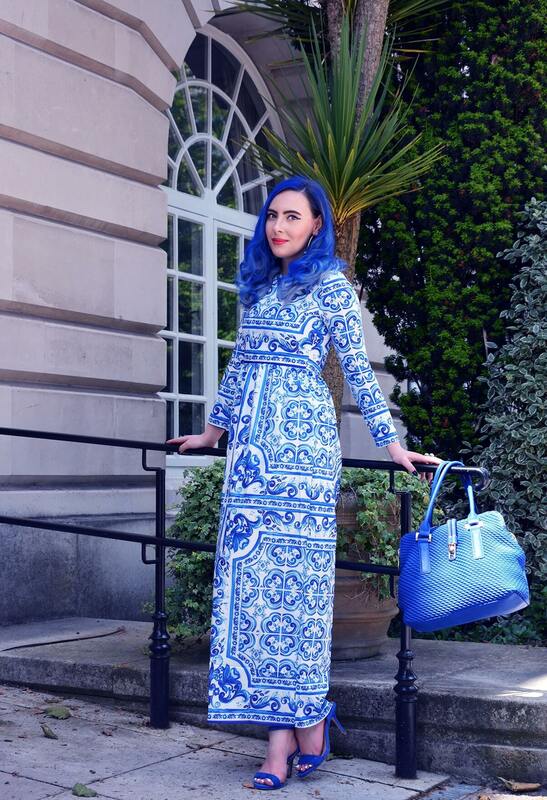 Wow, you look stunning in blue!!! 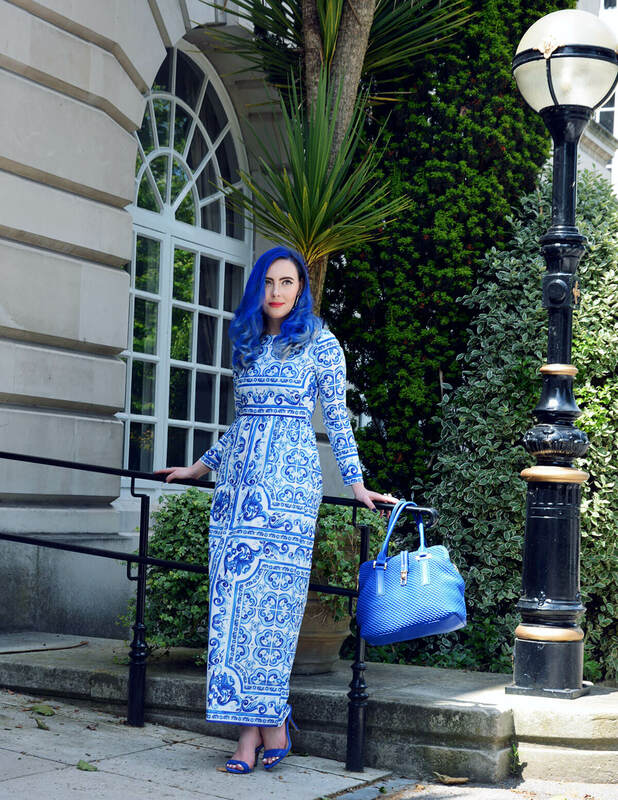 And that dress… just fab! Aww that’s such a wonderful color and it really suits you a lot! Love your wavy hair! So in love with the images from this shoot! You look so serene, such a dream with that amazing blue hair. 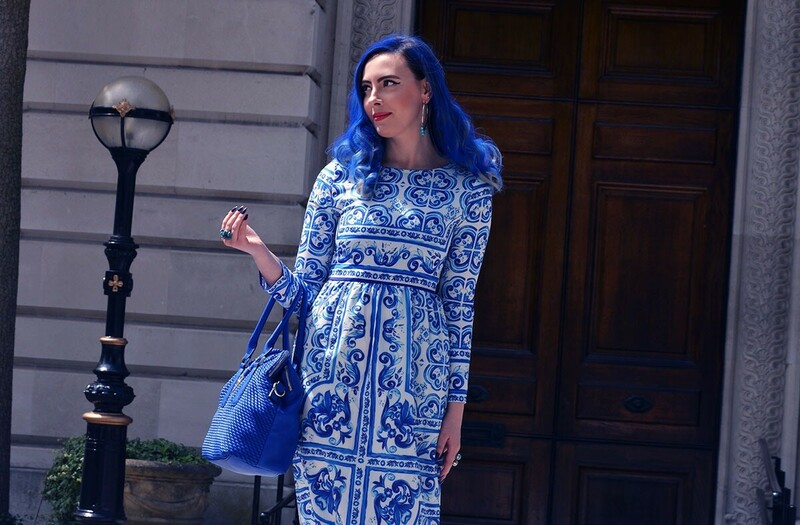 This enchanting your clothing and your magical blue hair! 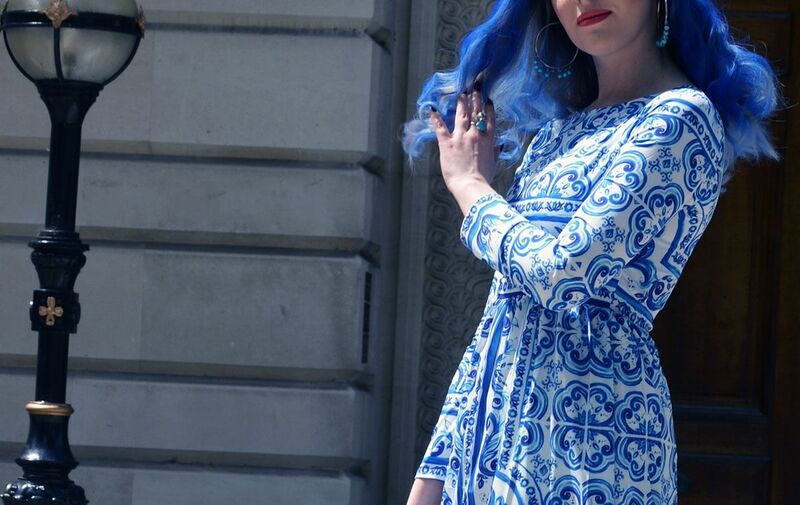 I feel nostalgic for my blue hair in the 90s, when I was a little rebellious … Your style in these photos brings back memories of the Homeric poems, legends of mermaids and the charm of Greece, with its colors that are a summary of the summer and the Mediterranean culture! Congratulations, you are really beautiful! outfit really cool, I love it!! You are truly a vision in blue. 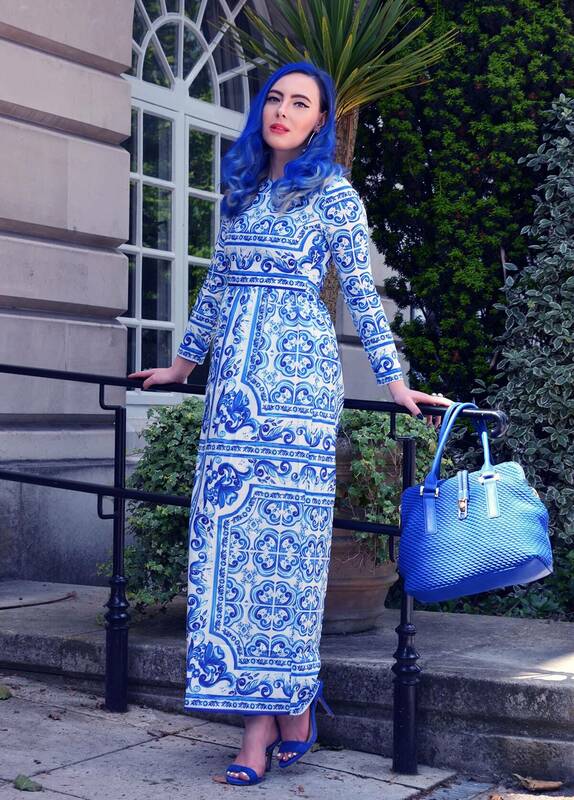 Love the tile- toille print of the dress, the bag, and that Hair!! LOVE! 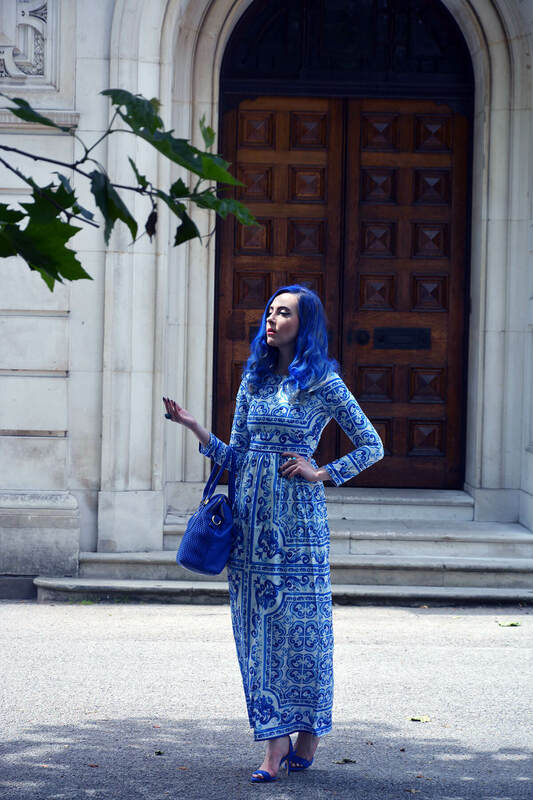 Love this all blue look! Your hair looks amazing, and that dress is gorgeous. Your look is amazing. I am in love with those sandals and dress.